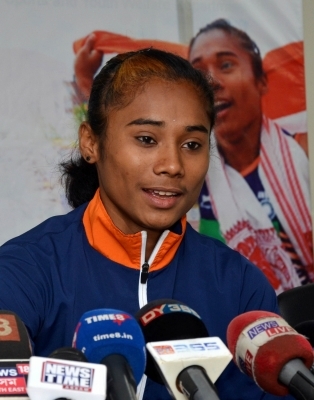 New Delhi Sep 16 (IANS) Ever since she was a kid Hima Das woke up every morning before the crack of dawn and would go to the local grazing ground in a remote Assam village. With no proper gear or even a playground she practiced running at this grazing ground around 50 metres from her house before the villagers let their cattle loose post sunrise. Daughter of rice farmers the same teenager left the world awestruck when she ran at a track and field stadium in Finland during the 400 metre final at the U-20 World Championships becoming the first Indian sprinter to win a gold medal at an international track event. The 18-year-old from Kandhulimari village in Dhing -- a small town situated approximately 20 km from Nagaon -- followed that with a gold in the women s 4x400 metres and silver medals in the women s 400 metres and mixed 4x400 metres events at the recently-concluded Asian Games at Jakarta Indonesia. There are numerous such stories of Indian athletes who came from poor underprivileged families but who showed true grit and fought extreme odds to make their families and the nation proud. Swapna Barman daughter of a van-rickshaw puller and tea-estate worker from Jalpaiguri in West Bengal overcame extreme poverty to become the first Indian woman to achieve a top podium finish in the gruelling heptathlon event at the Asian Games. The Indian Army rower Dattu Baban Bhokanal did all sorts of odd jobs from digging wells to selling onions to working at a petrol pump in his arduous journey to the gold in men s quadruple sculls event at the Asiad. Harish Kumar who was a part of Indian sepak takraw team that won bronze at the Asian Games used to sell tea at his father s shop in Delhi to support his family. These are not isolated instances. According to one of India s most celebrated athletes Anju Bobby George this is more a norm than an aberration. Perhaps because due to their tough lifestyle and the absence of too many options in life "they have insatiable hunger to succeed" George told IANS. "Children from rural areas or poor backgrounds engage in physical activities as part of their normal daily routine. After returning from school they either work in the fields or play sports. So naturally most of our sports stars come from rural areas " he said. Recalling Hima s childhood her mother Jonali recalled she was always competitive and hated losing and related how she practiced running at a local grazing ground every morning before dawn as the villagers came there with their herds of cattle after sunrise. Swapna Barman from Jalpaiguri town in northern Bengal was born with six toes. She never found a shoe that fit her perfectly and pain was part of her life ever since she started walking. But enduring that constant pain she won gold at heptathlon at the Asian Games. The heptathlon is a grilling seven-event contest which covers a range of track and field events and is spread over two days. Swapna s father Panchanan Barman has been bedridden for the last few years. "It was not easy for her. We could not meet her expectations all the time but she would never complain " Swapna s mother Basona told IANS in an emotion-choked voice. The extra width of her feet makes landing painful and shoes wear out quickly. She found it difficult to meet the expenses of her equipment said her childhood coach Sukanta Sinha. "I was her coach from 2006-2013. She comes from a very poor family and could barely meet the expenses of training. I saw a spark in her when she was in the fourth standard. I started training her " said Sukanta who could not get past the state level himself his best being a third place finish in triple jump in a inter district meet in Bengal in the 1980s. "She was extremely stubborn and that worked in her favour. We at Raikot Para Sporting Association club supported her with all the equipment and shoes. Today I cannot express in words how happy I am " he added. In Maharashtra Dattu Baban Bhokanal endured unimaginable suffering and hardships before achieving the pinnacle of sporting success. The Indian army rower won gold in the Men s Quadruple sculls event at the Asiad. The 27-year-old who had claimed a silver medal in the men s single sculls at the Asian Rowing Championships in 2015 is currently one of the top rowers in the continent. But his upbringing and early struggles is typical of millions of sportspersons in the country. From digging wells to selling onions to working in a petrol pump to representing India at the Rio Olympics while his mother was in a coma Dattu has overcome every obstacle in life. "We could not even afford two meals a day and it was then that I decided to start working with my father who used to dig wells " Dattu told IANS. After the death of his father Dattu joined the Indian Army a decision which was driven more by the need to feed his family than serving the nation. "In 2013 I was selected for the Army Rowing Node (ARN) in Pune for better training. After six months of practice I struck two gold medals at the national championships and that was a confidence-booster " he said. Boxer Amit Panghal another rising star hails from the msall Mayna village in Rohtak district of Haryana. His father Chaudhary Bijender Singh Panghal owns just an acre in his village and the family struggled to make ends meet. "My elder brother was a boxer as well. He introduced me to boxing. But my family did not have the resources to support both our careers. So my brother decided to sacrifice his dreams for me and joined the army " Amit said. "He told me before going to the army that he will take care of the family and my training expenses and asked me to focus on my boxing career. His words left a deep impression on me and I have been striving to live up to his expectations ever since " he added. The 22-year-old started training in 2007 at the Sir Chhotu Ram Boxing Academy in Rohtak. Trained by coach Arjun Dhankar Amit enoyed an explosive start to his career at the national and international levels. The light flyweight (49 kg) boxer won the gold medal in his debut appearance at the national championships in 2017 and took bronze at Asian Amateur Boxing Championships in Tashkent in May last year. He took silver at the Commonwealth Games earlier this year before defeating reigning Olympic and Asian champion Hasanboy Dusmatov in the Asian Games final.